Alpha Cook: Love it or hate it? I really had no idea that cilantro was such a controversial herb until last week when I came across an article about the masses of people who absolutely hate — not just dislike — cilantro. 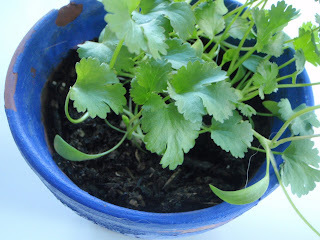 I for one, think cilantro is amazing, which is why I have a ton of little seedlings started for my garden. But apparently there are people in this world who are repulsed enough to start Facebook groups expressing their disdain. One such person mentioned in the article actually returned his take-out burrito after getting home and discovering that there was cilantro in it. By return, I mean, drove 20 miles back to the restaurant to get another one and created a huge fuss. Really? Isn’t that like returning your pizza because you found oregano in the sauce? What a nitwit. I mean, it’s one thing if you specifically asked for them not to put it in there, but were you really that surprised when cilantro showed up in your Mexican food? Jerk. I once found a rock (more like a small pebble) in my burrito and I was almost too lazy to take it back, and it was only 2 miles away. Maybe I just lacked the proper motivation. And don’t just think I’m biased ‘cause I happen to like the green stuff. I hate fish sauce more than just about anything in the world (except for maybe people who pass on the right), but when I go to a Korean restaurant, I don’t demand that they bring me a dish of fish-free kimchi.